And she’s bacccckkkk!!! After long years, the one and only Mutya ng Masa graces our screen again with her strong and feisty presence. Whether it’s asking the taumbayan questions for senatoriables, going back and forth with people on the street on their opinions of things, or showing her natural flair of humor and comedy on Gandang Gabi Vice, hers is a presence that was greatly missed. As if that’s not enough, she also serves as a fairy godmother very Tuesday afternoon in her own public service program, 2013 reunited us with this lively lady muse. Sure, the Philippine independent cinema has been roaring and peaking as each year passes, but aside from the movies that we see, we’re also showered with the great talents that we witness. 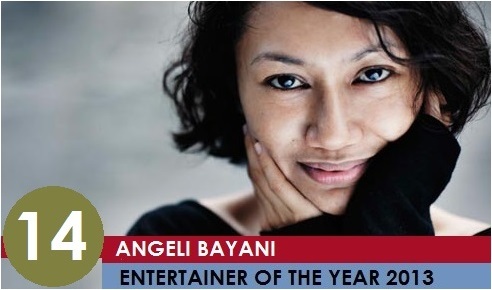 And this year, indie figure Angeli Bayani is definitely the queen of festivals. You can find her participating in the Cinemalaya entry Purok 7, Sineng Pambansa entries Lauriana and Tinik and in the CineFilipino entry The Guerilla is a Poet. As if that’s enough yet, she shares the same distinction this year with Marion Cotillard and Carey Mulligan: all three of them graced the Cannes Film Festival multiple times as she’s a part of Lav Diaz’ Norte, Hangganan ng Kasaysayan, and Singapore’s Oscar entry, Anthony Chen’s Ilo Ilo. 2x Oscar Best Director Ang Lee summed it best, when he said Angeli is a national treasure. Ever since his breakthrough in One True Love last year, Kapuso actor Alden Richards is definitely primed to be the next big leading man of its network. As a proof, he participated in two Kapuso series this year (Indio, Mundo Mo’y Akin), starred in his own Magpakailanman episode, and will soon be seen in the Metro Manila Film Festival entry 10,000 Hours alongside Robin Padilla. That’s more than enough confirmation that this mestizo hunk is definitely being groomed to follow the paths of Dingdong Dantes and Richard Gutierrez among others. Oh, and who would forget his Cosmopolitan Bachelor Bash stint this year? If there’s one love team who definitely takes the cake as the most remarkable this year, no question that it’s the team up of Kapamilya stars Daniel Padilla and Kathryn Bernardo. Collectively known as Kathniel, they have managed to sweep the whole nation’s feet and surge into their best year yet as a love team. Last March, they had their launching movie Must Be Love which performed greatly at the box office. And as before the year ends, they’ll once again star in the lone horror MMFF entry Pagpag which will be another of their blockbuster. But aside from that, their follow up teleserye Got 2 Believe not only is a consistent top rater, but it’s definitely on Twitter’s trending topic worldwide EVERY.SINGLE.NIGHT. It’s definitely a career peak for both of these teens, and we’re waiting what’s next for them. The most prominent siblings in collegiate basketball the past season, the whole UAAP men’s basketball finale was all about one surname: TENG. Elder brother Jeric Teng of the UST Growling Tigers competes with younger sibling Jeron Teng of the DLSU Green Archers during the best of three series. And while it’s Jeron and the rest of the Green Archers that added a championship trophy in their mantle, the biggest winner from this are parents Alvin and Susan Teng whose hundreds of interviews and guesting stints this season have already emphasized how proud of them of their kids. The good things doesn’t stop there though, as Jeric easily got drafted by Rain or Shine Elasto Painters in the PBA while Jeron, if not doing guest stints in Got 2 Believe, continues his stints everywhere. 2013 is probably the best year in a long time for Philippines in the pageant world, as it’s a year of firsts, fabs, and fun for this pageant loving country. Megan Young clinched the country’s first ever Miss World title when she won last September. Weeks before, Mutya Datul also gave us our first Miss Supranational title, and just two days ago, Bea Rose Santiago clinched us out fifth Miss International title (just one crown away in tying the best performing Venezuela). As if that’s enough yet, Ariella Arida continued the winning streak of our Miss Universe contenders by placing in the Top 5 for the fourth consecutive year. Both Cindy Miranda and Angelee Forbes also ended up as semifinalists in Miss Tourism Queen International and Miss Earth contests respectively. Then Ali Forbes also ended up as third runner up in Miss Grand International. And to cap this fantastic year, Gil Wagas is 4th Runner Up in the Mr. International pageant. Whew! 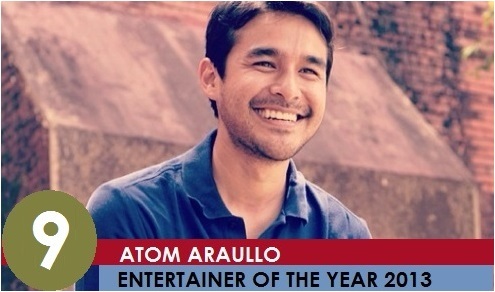 As if he’s not on anybody’s list yet, ABS CBN’s in house reporter Atom Araullo suddenly became the country’s top leading man. Only this time it’s not for the movies. His commendable and brave coverage of the Yolanda incident last month gave new meaning to the word professionalism. Not only did he turn out to be the unsung hero of the incident, it also gave birth to memes such as the Man in the Rain and ATHORM Araullo. But what’s more impressive about it is that you know the man is not doing it for the acclaims or the buzz, but more of the human intention of helping other people. Apart from that, he continues to be a reason women wake up in the morning – literally that is – via Umagang Kay Ganda and creeping us every Friday afternoon with interesting stories in Hiwaga. Definitely one of the prettiest faces in the biz then and now, Vivian Velez made 2013 a perfect comeback year for her both in television and movies. In the small screen, she starred in two series for two networks with Misibis Bay in TV5, and as Malvina Sancuevas in the local adaptation of famous Mexican telenovela in Maria Mercedes in ABSCBN. In the big screen, her short but memorable stint as the female boss in On the Job made her the fierce female boss, but more than that, her participation in the Cinema One Originals entry Bendor not only gave her her first lead role status in years, but also a Best Actress accolade in the said festival. What a comeback indeed. Rap music continues to be a force to be reckoned with in the Philippine music scene, after the likes of the late great Francis M., and Gloc 9 kept it alive the past few years. The latest addition and poster boy of the said genre is 23 year old Raymond Abracosa, more familiarly known as Abra. Initially a part of the hiphop group LDP (Lyrically Deranged Poets) back in 2010, the rise of the fliptop sensation introduced him more to the general public. 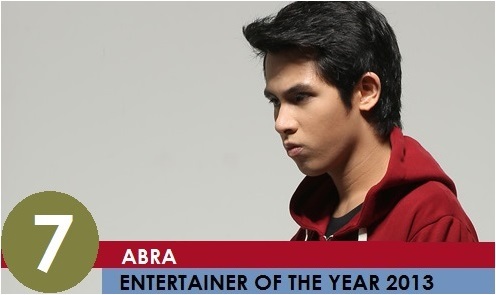 Last August, Abra launched his first concert and has performed in over 25 different TV shows the past year in the three largest networks of the country from ABS CBN’s Gandang Gabi Vice and Minute to Win It to GMA’s Celebrity Bluff and TV5’s Wowowillie. 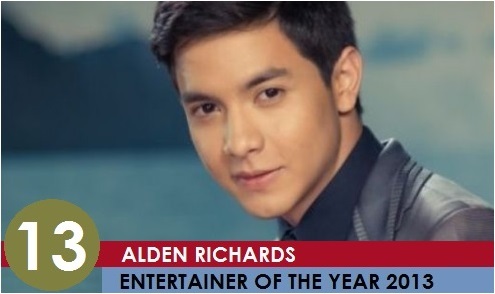 Now a certified household name, I’m pretty certain it takes more than a gayuma or an ilusyon on why he’s one of 2013’s entertainers of the year. Big things come in small packages. Or in this case, big talents come in small eight year old girls. Ryzza Mae Dizon is probably as cute as a button but I’m sure you’d be wowed by all her achievements thus far. Hosting her own talk show The Ryzza Mae Show everyday then going straight to Eat Bulaga! right after, that’s just a part of Aling Maliit”s daily routines. She has also covered magazines, starred in a lot of advertisements. and won awards left right from Child Star of the Year up to Best Talk Show Host. 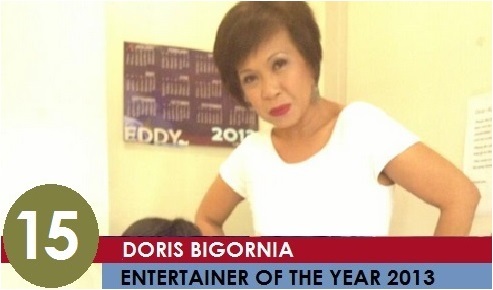 And she’s ending this year with a bang by starring in her own MMFF entry My Little Bossings. Her 2013 alone can definitely be considered as one of the greatest in the history of child stars. What a year for this pretty mestiza actress! Not only did she step out from being one of the second tier actresses in her station, she carved a name for herself as one of 2013’s biggest breakthrough stars. Probably the greatest thing that happened to her this year is that she went single as it opened a lot of new doors for her career wise. Playing the coveted title role in Maria Mercedes, Jessy not only showed us her amazing salsa skills, she also highlights her acting chops amidst the great veteran actors of the show. And of course, the endless magazine covers she had (even twice in the same month!) and appearing as Pokwang’s daughter in Call Center Girl. But I guess if there’s one visual image that Jessy left her stamp in 2013, it’s that ordering a McSpicy meal hasn’t been sexier the way she did it in her commercial. 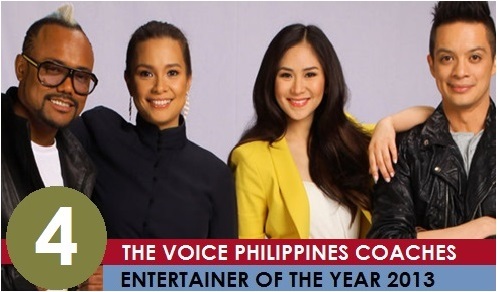 Certainly one of the best things that happened to Philippine singing shows, The Voice of the Philippines just murdered all these other local adaptations of foreign singing shows by coming up with an inspired coach line up. On one hand, you have apl.de.ap, a part of the prominent Grammy winning group Black Eyed Peas. Then there’s rocker Bamboo whose fanbase continues to grow as his years in the industry grows as well. Then there’s Pop Royalty Sarah Geronimo who still remains as the best output of her generation. And to complete the quartet, Tony winner and definitely on a league of her own, Lea Salonga. Aside from their natural chemistry, one of the best things they produced are their different coaches collaboration which we got a lot this year from Imagine to Man in the Mirror and even up to the official Christmas soundtrack. I mean if you’re gonna be coaching people in a singing competition, then you better show them how it’s actually done. Ever since he entered show business way back in 2009, there’s no doubt that 2013 has been the best by far for hunk Tom Rodriguez. Earlier this year, he’s best known as Aiza Seguerra’s partner Pards in the daytime hit drama Be Careful with my Heart. Months after, her switched networks to GMA, and that proved to be the best career decision by far. He got his first primetime lead role via the buzzed show My Husband’s Lover which opened more doors not only for him, but an unlikely love team with co-star Dennis Trillo (a.k.a TomDen). This show catapulted him not only to leading man status, but a pin up boy as one of the two faces of this year’s Cosmo Bachelor Bash. He’s also a recording artist and did concerts here and abroad with the rest of My Husband’s Lover’s cast. With this great 2013, he definitely jumps his way as one of the best and most successful post-Pinoy Big Brother careers. One word: PUSO. Probably in the best local basketball result of the year, it has been a long and winding road for this Philippine basketball team. But like anything else, patience is definitely worth the wait. Whether facing issues of the events venue, finding an immediate replacement for the host country, and even player participation, Gilas Pilipinas lives up to its name by showing greatness among other things via the team’s hard work and resiliency. That’s why when they’re up against that crucial game against Korea, the whole country is on their back supporting the whole team. And I’m certain that when that game ended, not a dry eye can be found on the whole arena as all you hear are loud congratulatory cheers. And while the team wasn’t able to beat Iran in the final round, who even cares anymore? It’s all about Madrid in 2014, and I’m sure the country will be there again to support this team, and the team will be motivated than ever to bring pride to the country. 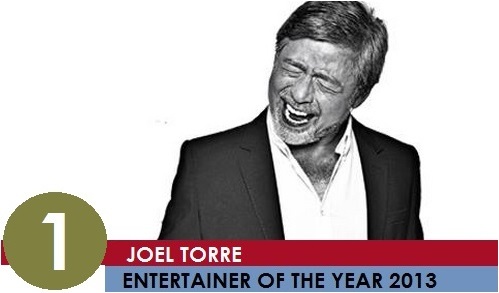 And 2013’s Entertainer of the Year is none other than… Joel Torre. In probably one of his most notable years in his career, Torre aced both the small and big screen this year. He started this year in the small screen as Pepe in Juan dela Cruz and ended it up with the role of funny and conniving Governor Hugo Layer in Honesto. But aside from that, his most remarkable moments for this year were his performances in the movies. As Tatang in On the Job, Torre shared lead star status with the likes of Piolo Pascual and Gerald Anderson. Then his Best Actor winning portrayal in the Cinema One Originals entry Kabisera as the controlling patriarch gave him two of the finest roles to work on this year. It’s rare that actors of his age get meaty roles like this, but it’s even rarer to find actors who’ll give justice to both roles. He already earned two Best Actor trophies, each film apiece, and he better makes more space for his shelf as he’ll be getting more this coming awards season. And with that, there’s person no more fitting to own the title of 2013’s Entertainer of Year than him. There you have it! 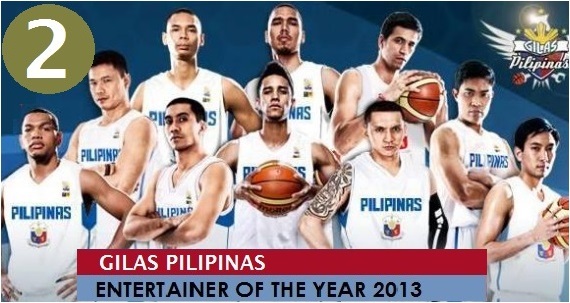 2013’s honor roll as Entertainers of the Year! Who were your favorites in the list? Who do you think were overlooked? And who are your personal entertainers of the year? I’d love to hear your thoughts as well!